Spring green matcha macarons filled with mango buttercream. 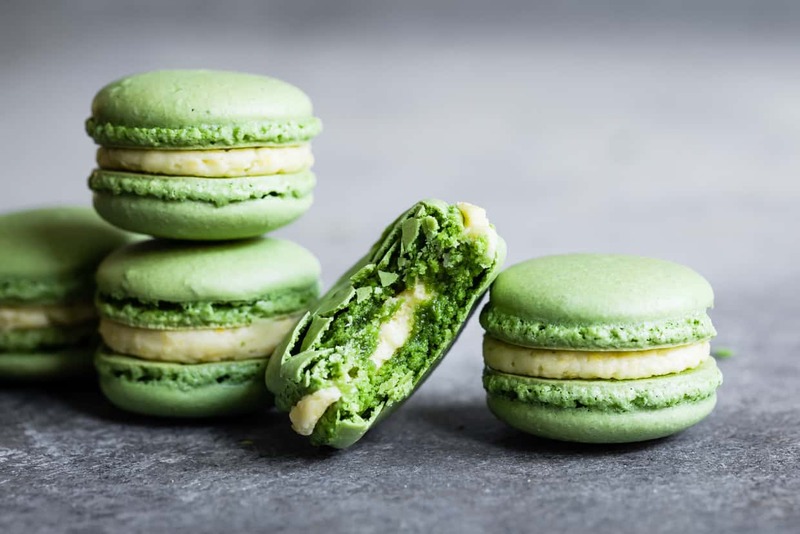 These French macarons have a crispy shell with a chewy center and an earthy matcha flavor that complements the almond flour base. 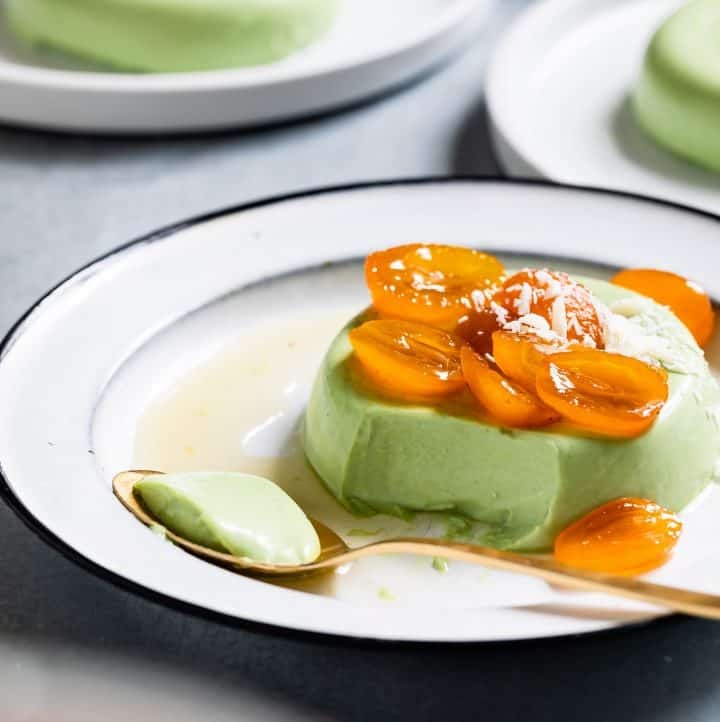 The filling balances the flavors with a tart buttercream made with ground freeze-dried mangoes. Our first night in Paris this past November, we had one must-do on our agenda: find macarons. By the time we did, it was about 10 minutes before closing and way past toddler bedtime. Zoella had gone a full day in Paris without eating a single thing save for the apple sauce we packed for emergencies. Picky eaters take it to a whole new level in a foreign country. She wanted nothing to do with any food we offered her, but a random stranger behind the counter offering her a free macaron? No hesitation at all. Up until this moment, this kid had never eaten a cookie or really much of any sugar, yet somehow she knew those colorful little morsels under the glass were special. Like mother, like daughter. Made with just almond flour, macarons are naturally gluten-free, making them my go-to Paris treat. 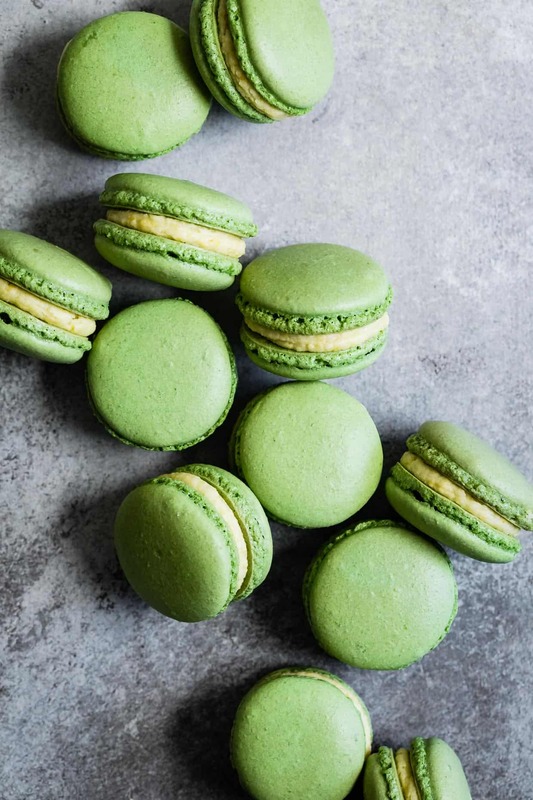 This recipe for matcha macarons with mango buttercream is the second in my year-long partnership with Bob’s Red Mill. First we ate chamomile oat waffles and now I’m busting into the almond flour to perfect one of my favorite sweets. 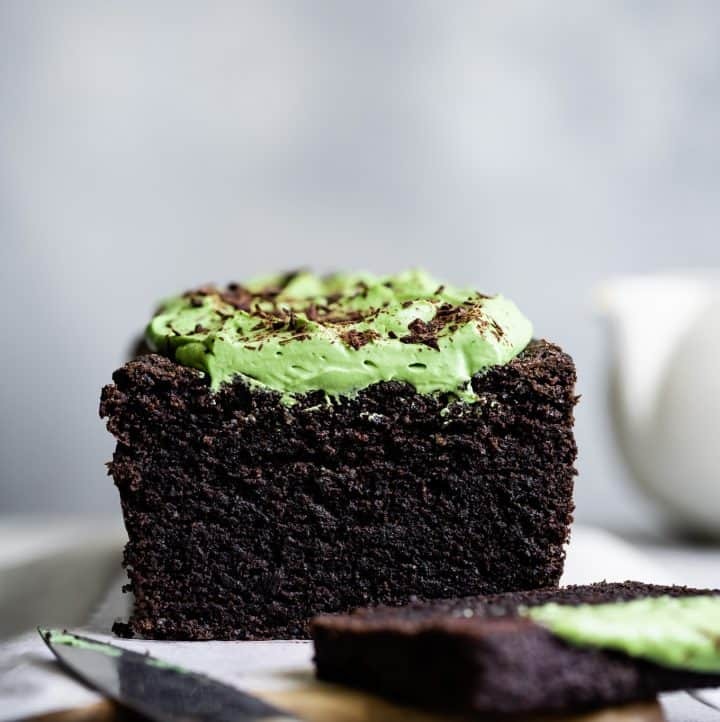 I also incorporated matcha because it’s still Matcha March, lest we forget! In the past month I’ve used over 2 dozen egg whites and 3lbs of almond flour just on macarons. I’ve been afraid of and avoiding making macarons ever since my friend Lisa and I first tried our hand at macarons several years ago and failed. See how quickly I threw in the towel? Sometimes good things take time and practice though – I’ve been working on reminding myself of this now that I’ve got a toddler who gets frustrated at the first sign of struggle. We got Zoella a wooden balance bike for her birthday. At her party, in front of her friends and family, she climbed right up and then just as quickly toppled right over. She was embarrassed and done. We clearly underestimated the skill required to balance a bike. The next day, we asked if she wanted to take her new bike out for a ride. She picked up the new bike and said, “Daddy, fix it! It not working.” We’re still trying to convince her that it takes practice and she’ll figure it out eventually. Is it difficult to make macarons? So, I pulled out the almond flour and egg whites and decided I should heed my own advice in the face of pesky macarons. I kept failing, but kept trying, researching, and watching baking Youtube videos. In one week, I made eleven batches of macarons. It took 5 batches to get edible macarons I was proud of – evenly round without cracks, tall feet with a crispy shell, and a perfectly chewy center. The next few batches were my attempts at testing and honing the recipe. Hopefully these tips on what I’ve learned along the way will shorten your learning curve. That being said, I think the biggest take-away I learned is that, regardless of how much research you do, how many recipes you read,and how many videos you watch, so much of perfecting macarons is experiencing what the final texture for the egg whites and the macaronage should look like. It’s subtle. So expect to use a few egg whites (save the yolks for these hibiscus strawberry curd tarts!) and possibly even throw away a batch or two in the learning process. The great part is, macaron shells really don’t require all that much time and the reward is oh-so-worth the effort of practice. What I didn’t realize before I started researching macarons is that there are three main methods to making macarons that have to do with making the meringue: French, Swiss, and Italian. In the French meringue method, sugar gets added to the egg whites while beating – no heat is applied. In the Swiss meringue method, the sugar and egg whites get whisked over a double broiler until the sugar dissolves, then transferred to the stand mixer to beat to stiff peaks (to see the Swiss method in action, my friend Sarah has perfected it!). In the Italian meringue method: sugar and water get cooked together then slowly added while the egg whites are beating. In my research, some folks suggest the Swiss and Italian method help to stabilize the egg whites, making them a bit easier for beginners to master. In practice, I did not find this to be true and had much better and faster luck with the French meringue method. Plus, no heat means an easier process and less clean-up! That’s the method I used here. I’ve included cup measurements below so you have an idea of how much flour you’re looking for, but for a recipe as finicky as macarons, I would recommend weighing your ingredients (including your egg whites). I used only eggs that were at room temperature (that I would soak in warm water for 10 minutes to make room temperature because patience is not my strength). I also found no difference in the outcomes of old to new eggs. You want the egg whites to be stiff and glossy to the point where the egg whites clump in the beater, but you don’t want to over beat them until they look dry instead of shiny. Honestly, different recipes will tell you all kinds of different things here, but I found I was more likely to fail if I under beat the egg whites than if I over beat them. For the under beaten egg whites, the macarons never set to a hard shell and I had to trash them. 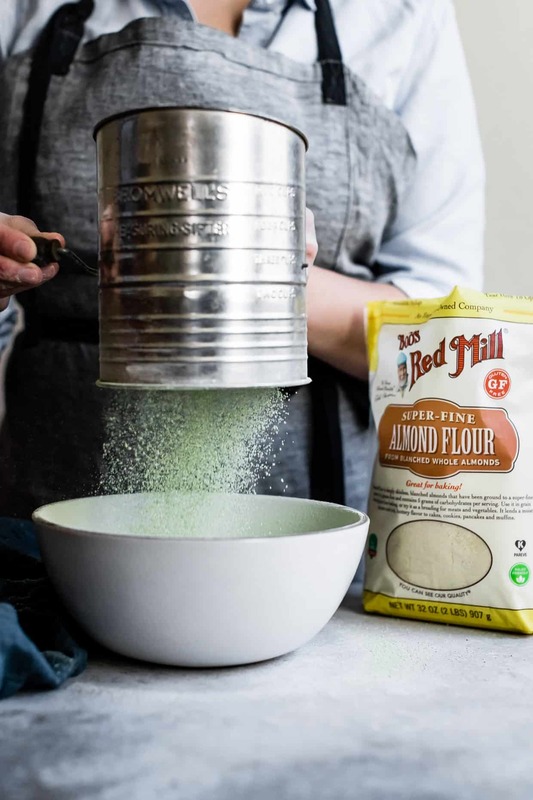 Start with a super-fine almond flour like Bob’s Red Mill to make sure your macarons are smooth after baking. Honestly, I have no idea what sifting them twice does, but when I sifted them once, my macarons were less likely to turn out perfect. My best guess is that you don’t want to over beat your macaron batter after adding the dry ingredients but you also don’t want clumps of flour. So it’s important to start with extra sifted flour and powdered sugar so you don’t have to over beat to get the clumps out. 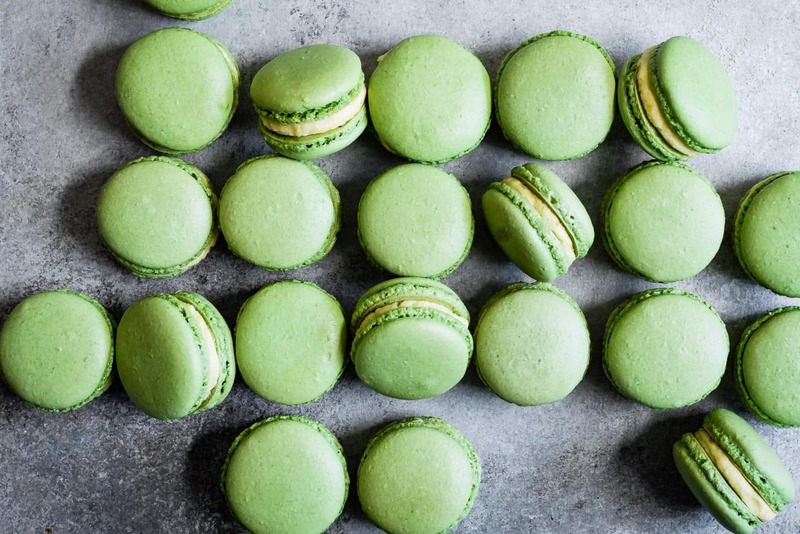 This is where success comes in – once I experienced what the batter should look like, I had beautiful macarons every time. This is the step that I describe as requiring a few tries to get it perfect – if you vary nothing else in your process in the quest for macarons, this is where you should focus. First, combine your dry ingredients and egg whites by hand with a rubber spatula. Use a circular motion around the bowl and then cut the wide side of the spatula through the center, pressing batter against the edge of the bowl to knock the air out of the batter. Most recipes describe the texture as molten lava, which I find only partially helpful because I’ve never actually seen molten lava. Others suggest that you should be able to lift your spatula up and make a figure-8 with the batter running off the spoon without the batter breaking into big clumps. This is also true, but if you over beat the batter, your macarons will fail. If it’s too smooth and creates a figure-8 too easily, then it’s possible you over beat the batter. I found that if I took a spoonful of batter and put it onto the baking sheet, it should initially hold its shape for 5-8 seconds, but after 20-30 seconds, it should soften to an almost smooth top (a subtle little “tip” is even good to show you did not over beat – here’s a video to show what it should look like). 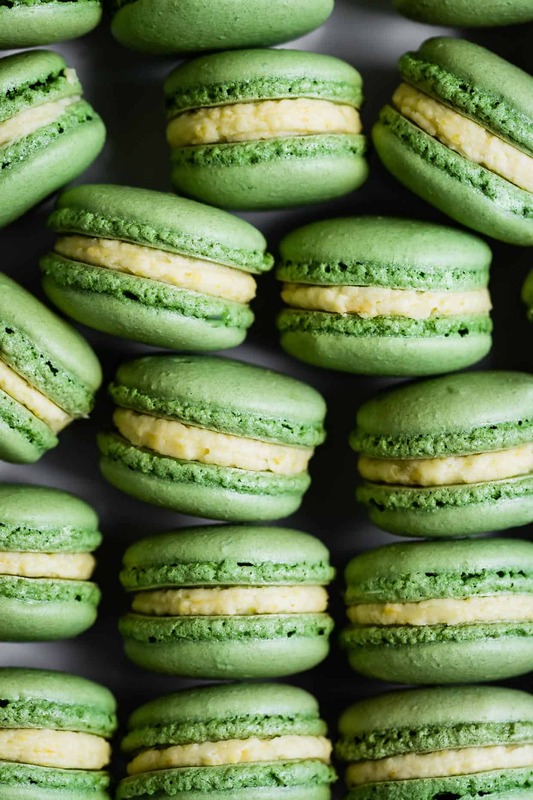 I’ve found that it’s better to err on the side of under beaten – when I over beat the macaron batter, I would not get the crisp shell, and instead the macarons would be almost greasy looking and completely soft. Inedible. When you under beat, you run the risk of macarons that crack or have large air pockets, but, they’ll at least still be edible. When your batter is ready, put the batter into a piping bag. If your batter oozes out of your pastry bag into a smooth plop almost immediately, you’ve mixed too far. If your batter completely holds its shape when you pipe your macarons, you haven’t mixed enough. Dry your macarons out for 20-30 minutes on the counter until they are dry to the touch (this time will vary depending on the humidity). This will help prevent your macarons from bursting and also will help them develop the classic foot. Some recipes say to cook the macarons at higher temperature, but when I tried that, they rose too quickly and either burst or were completely hollow. I had better success when I cooked the macarons at 300°F for 13-16 minutes. When you gently shake your baking pan in the oven, the macaron tops should not slide or jiggle at all when they’re finished baking. If you try to lift a macaron off the parchment paper and the top peels off, leaving the centers behind, they’re not done baking. On that note, make sure you have an accurate oven thermometer to make sure that any failures are not simply due to a fluctuating cranky oven! If your shells have a nice chewy center and a crisp shell, but a small hollow space between the center and the top of the shell, don’t be too alarmed. Once you add filling and ripen the macarons in the fridge for 1-3 days, that hollow top should almost disappear. First, read all my tips above to know what the consistency of the macaron batter should be. Preheat oven to 300 degrees with rack in lower third. Sift together almond flour, powdered sugar, and matcha. Sift a second time. In the bowl of a clean and dry stand mixer fitted with the whisk attachment, whisk the egg whites and granulated sugar gently to combine. Beat the egg whites and sugar on medium speed (4 on a KitchenAid) for 2 minutes. Increase the speed to medium-high (6 on a KitchenAid) and beat for an additional 2 minutes. Increase the speed once more to high (8 on a KitchenAid) and beat for 2 minutes longer. Your meringue should be very stiff and glossy, and clump together in the beater. Tap the meringue out of the whisk. Add your sifted dry ingredients to the meringue all at once. Use a rubber spatula to fold the meringue in a circle scraping the outside of the bowl, then cutting the flat side of the spatula through the center of the batter, pressing against the side of the bowl. Repeat this process until the batter reaches the consistency of molten lava as described above, 40-43 strokes. Place a pastry bag (or large disposable plastic storage bag) fitted with a 3/8-inch round tip inside a glass or bowl. Transfer the batter to the bag - if you notice some unmixed dry ingredients in your bowl, do not incorporate or transfer them - and twist the top of your bag closed. Line two half-sheet baking sheets with parchment paper (I use the parchment paper with macaron guides printed on it! ), using a bit of the macaron batter to secure the corners down. 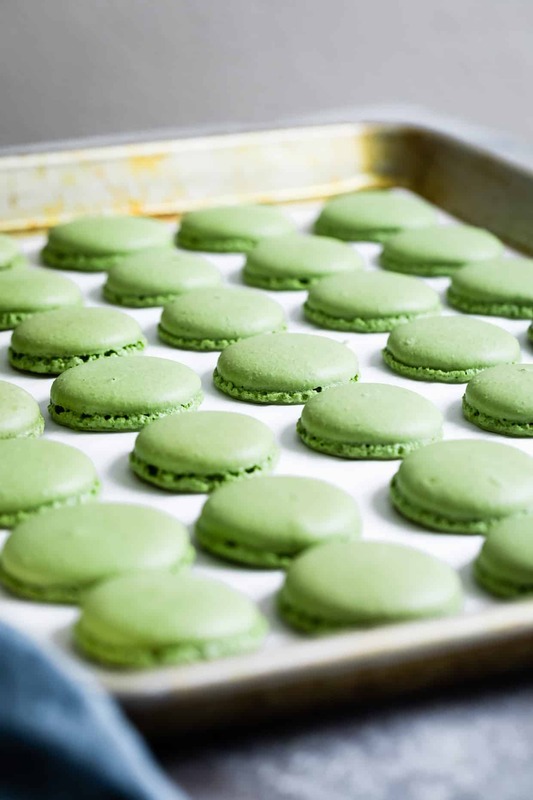 Pipe the batter into a 3/4-inch round, swirling the tip, spacing the macarons 1-1½ inches apart. Tap the baking sheets firmly on the counter 2-3 times to release any air bubbles. Let rest for 20-30 minutes, until the macarons are dry to the touch and the batter doesn't stick to your finger. Bake one sheet at a time until they have risen, and the tops no longer jiggle from the feet, 13-16 minutes. Let cool completely before filling. Once cool, make the buttercream below. In the bowl of a stand mixer fitted with the paddle attachment, cream the butter over medium speed. With the mixer on low, slowly add the powdered sugar, ground freeze-dried mangos, vanilla extract, and salt. Beat until combined. Add the heavy cream, 1 tablespoon at a time to loosen until soft enough to pipe, but still sturdy. Fill a piping bag fitted with a ½-inch round pastry tip with the frosting. Pair the macaron shells by similar size and shape. Pipe a dollop of frosting onto half the macarons, then gently make a sandwich with the paired macaron shell. 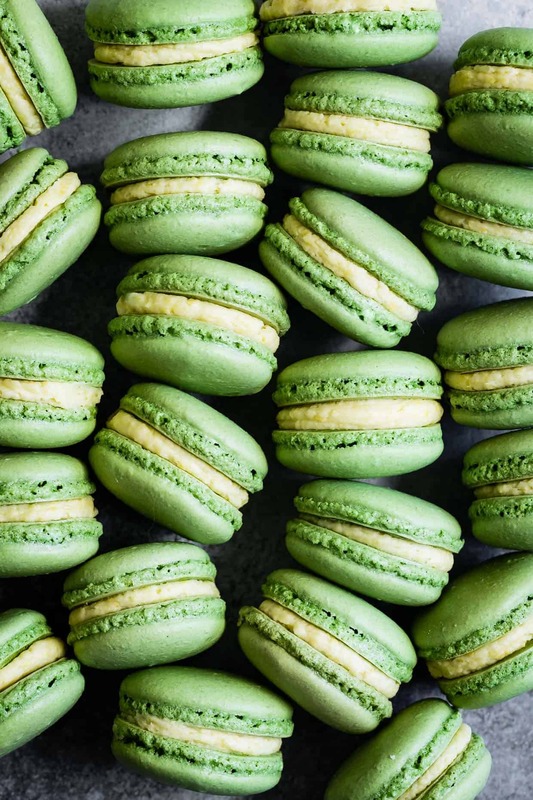 Keep macarons in an airtight container in the fridge to ripen for 1-3 days before eating and bring to room temperature for 30 minutes before eating. While I normally use organic powdered sugar and organic cane sugar in my baking, I used conventional powdered sugar and granulated sugar in macarons to eliminate a potential troubling factor. Organic powdered sugar is laced with tapioca starch rather than the traditional corn starch and I was worried that would influence the outcome! Let the truth be known Sarah………………………………these easily were even better than the ones you brought back from Paris! I’ve always been intimidated by macarons, but your tips made them sound simple. I love the idea of using freeze dried fruit in the filling! I think this may be my most favorite Matcha March post!! 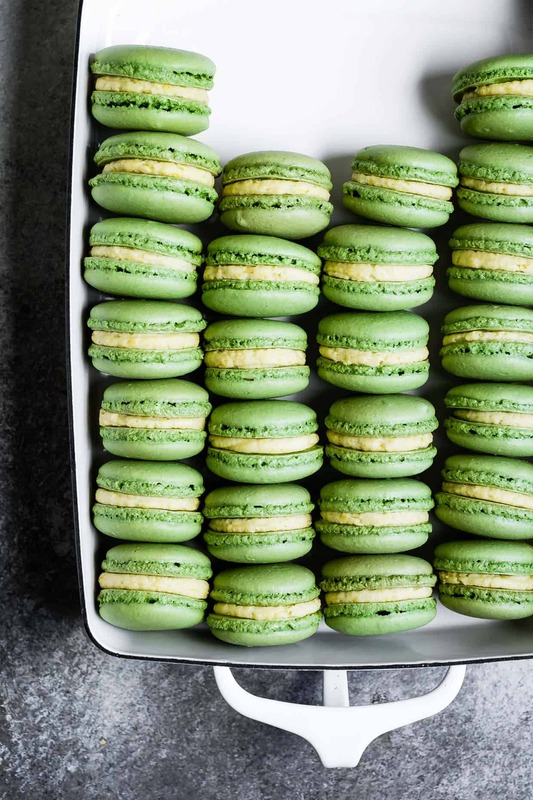 I love your tips – I have attempted macarons once and never came back to try again. Now I will! I’ve yet to get up the guts to try making macarons, but these just look so perfect and delicious! Ever since moving from NYC I’ve missed the macarons at Laudree. I used to walk there with my toddler and she and I would get a few and share them. Such a fun memory so I’ll have to make these for us soon. BEAUITFUL macarons! Quick question: did you dry out the almond flour prior to sifting and going on with the recipe? I have used the superfine Bob’s redmill in place of the their flour/meal product, and the tops of my macarons have been oily and translucent. I make macarons frequently, so I could have just gotten a bad bag! I didn’t dry out the almond flour before sifting. 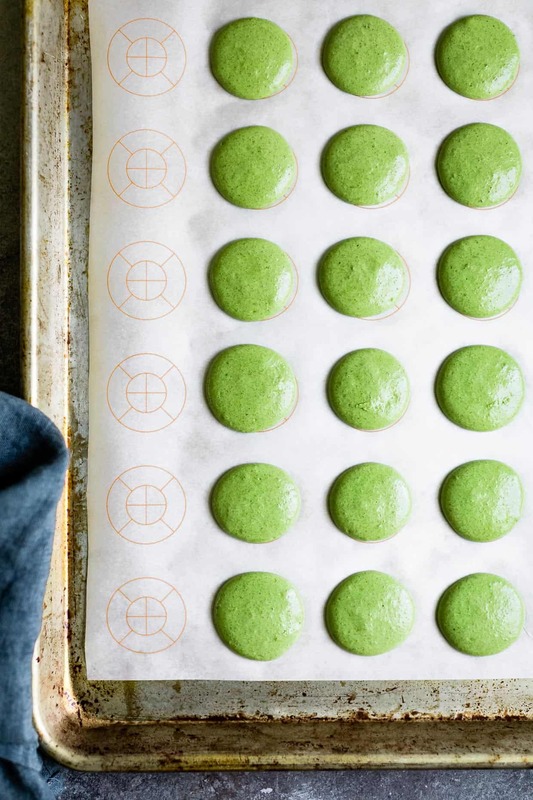 I like their superfine blanched almond flour, but I haven’t tried macarons with their other almond meals – worked great for me for multiple batches! I’d give it another try and let me know! Sarah. A colleague and I attempted to make these tasty treats on a lonely Sunday night. Sadly, your tips failed us. We followed your instructions meticulously and were met with colossal disappointment. The insides of the cookies were RAW!! While the outside feet were wide and mossy. Please advise ASAP. That being said, I’d love to help you troubleshoot. Macarons should be quite moist and chewy inside (though not raw) with a firm shell on the outside. 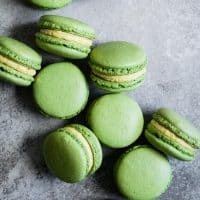 Here are two website I find super helpful in troubleshooting macarons: This first site and second site both give lots of tips for what to adjust next time given how your macarons turned out. From the way you describe it I have two ideas: did your macarons have a hard shell on the outside? If so, my guess is that your oven temperature may have been too high (ovens and macarons are SO finicky – I keep two oven thermometers in my oven to make sure I’m at the right temperature) so they rose and hardened quickly without giving the centers enough time to cook, which could also lead to spreading feet. Try reducing the heat and cooking them longer until the outside shell is hardened. If your macarons did NOT have a hard shell on the outside when you tap it or it was very thin, and instead looked very moist/raw (almost greasy), then I suspect you over mixed your batter – it can easily go from perfect to over mixed with just two turns (I err on the side of under mixed when in doubt). I will say – this was the number one cause of imperfect macarons when I was testing – It’s the reason I say you really do have to EXPERIENCE what the perfect macaron batter texture is because it’s very hard to describe. 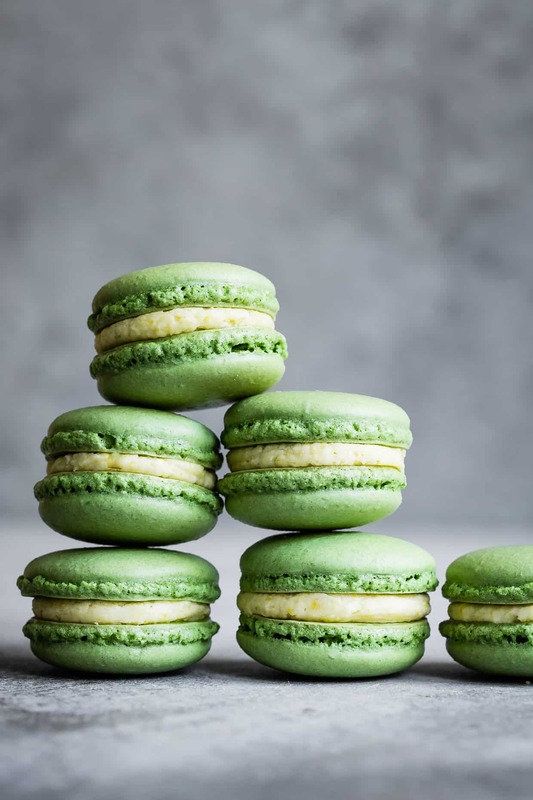 Hmm – I’ve never made them without egg whites BUT I know people who have done aquafaba macarons – I think you could apply a similar method here! Good luck!